The legend says that after Jesus' crucifixion, when the Virgin Mary moved to St. John's home, she took with her some personal articles, among them a table made by our Redeemer in St. Joseph's workshop. The story continues and says that when the pious women of Jerusalem asked St. Luke to do a painting of the Mother of God, he used this table to paint the image. The image remained in Jerusalem for a time, until the Romans began to destroy the city. Divine providence guided the image to Constantinople, where it was carefully protected by the Christians there. By 802, the image appeared in White Russia. During a war in the middle of the fourteenth century, the image was struck by an enemy arrow. Prince Wladyslaw, in order to prevent the destruction of the image, decided to transport it to the land of his birth. While traveling through Poland, with the image in a horse drawn carriage, the horses refused to go any further when they reached the town of Czestachowa. The prince went up to the chapel on top of the hill Jasna Gora to pray, since he saw the horses' refusal to go on as a divine message. 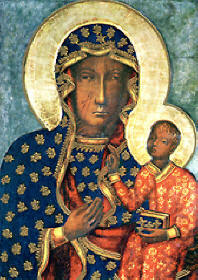 In a dream, Our Lady appeared to him, and told him she wanted the image to be venerated there in Czestochowa. This was in the year 1382. The prince ordered the building a a bigger and more elaborate Church, along with a monastery. Pilgrims began traveling from all over to venerate the image. She has been in Czestochowa since this time, and has become a national treasure of the Polish people, who venerate her as the Queen of Poland. The present Basilica in which the image resides was built in 1902. The painting of the Virgin belongs to the type of icons designated as Odigitria (a word of Greek origin meaning "The one who shows and guides along the way”). This wood painting measures 122.2 cm by 82.2 cm by 3.5 cm and represents the bust of the Virgin who carries Jesus in her arms. The face of the Virgin stands out in that whoever looks at the painting is found immersed in Mary’s gaze: the pilgrim looks at Mary who looks back. The Child also faces the pilgrim but with a fixed look. Both faces have serious and pensive expressions, giving the painting an emotional tone. Two parallel scratches crossed by a third mark the Virgin’s right cheek. Her neck shows six other scratches, two of which are visible, whereas the other four can barely be seen. In the image, Jesus wears a scarlet tunic and rests on His Mother’s right arm as a makeshift throne in order to be seated. The Child’s left arm holds a book, and the right arm is raised as if he was giving his blessing. The Virgin’s hand rests on his chest, points to the Child, and appears to tell us: “Pay attention to my Child Jesus.” The Virgin’s dress and mantle are adorned with the flower of lis, a symbol of the royal family of Hungary. The brightness of their apparel contrasts with the dark colors of their faces. A star with six vertices is depicted on Mary’s forehead. Both the Virgin and Jesus have golden halos. Given the dark color of the face and hands of Our Lady, the image has been fondly called “the Black Virgin,” a phrase which reminds us of the Song of Songs, “I am dark-skinned but beautiful.” Her darkness can be attributed to many reasons, one being the poor conditions of the places where she has been hidden to safeguard her. In addition, numerous candles have been lit before her, causing her to be constantly amidst smoke. As well, she most likely has been touched by a multitude of people. In the image, the wounds on her face were caused by some bandits who tried to steal the image in 1430. The wound on her throat was caused by the Tartars who besieged the castle of Belz; one of the enemy’s arrows went through the Chapel’s window and hit the icon. The two cuts on the cheek of the Virgin, along with the harm previously caused by the spear through her throat, always reappear despite the repeated attempts to restore the image. Throughout the history of the icon, our Blessed Mother has manifested her powerful intercession in the midst of many dangers. One of the most well-known occurred on September 14th, 1920 when the Russian army set up camp near the Vistula River, where they were preparing to invade the city of Warsaw. As a result, the people turned to the Virgin Mary. The next day on the feast of Our Lady of Sorrows, the Russian army withdrew its troops after an image of the Virgin appeared in a cloud over the city. The Polish refer to this victory as The Miracle of Vistula. The miracles attributed to the intercession of Our Lady of Czestochowa are numerous and spectacular, including resurrections. Princess Anna Wisniowiecka in 1613 was boating and fell into a raging river in the midst of a storm. She cried out to Our Lady of Czestochowa to save her, and Our Lady appeared and helped her safely to shore. At the end of the seventeenth century, there were a series of deadly epidemics that swept their way through Europe, including Poland. However, the city of Czestochowa was never touched by any. The Pauline fathers prepared for them, but they never came. These are just a few of the many miracles attributed to the icon and the intercession of Our Lady. The record of all the miracles attributed to this icon are kept by the Pauline fathers in Czestochowa.